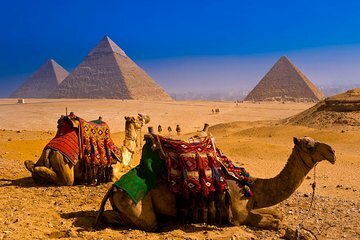 Enjoy two of ancient Egypt’s most iconic monuments, the Pyramids of Giza and Great Sphinx, during one quick 4-hour trip with a private guide. Gaze in wonder at the three pyramids that make up the Giza complex, including Khufu (the largest), Khafre and Menkaure, stopping at a panoramic photo spot to capture the site in its entirety. Finish your excursion with a visit to the mysterious lion-headed Sphinx, a monument that still baffles archaeologists to this day. Your visit also includes a private Egyptologist guide, private coach and round-trip port or hotel transport.